Did I mention that the weather was atrocious as well? 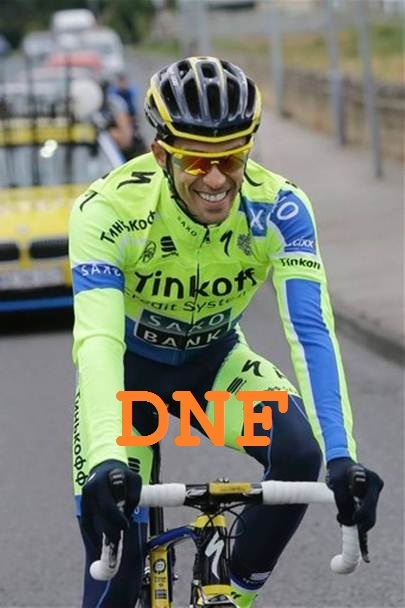 The third major shock exit happened on this stage, El Pistolero – Clentador – Alberto Contador (Tinkhoff-Saxo) crashed spectacularly not once but twice. And contrary to Phil Liggett and Paul Sherwen’s commentary during the race it was not due to failure of his Specialized bike frame. The riders around Alberto said he was taking risks on the downhill descents, dangerous risks. But I will call it what it is, bike racing at its toughest. As you have probably figured out I am not a big fan of Alberto due to part of his dubious past which no doubt was influenced by his team management at the time (Bruyneel et al). But he earned my mega respect by the huge demonstration of Rule #5. He broke his leg in the second crash, then got patched up, back on the bike and rode another 20km uphill to try and get back into the peloton. Alberto showed everybody how to HTFU! Maybe Arjen Robben and many other star players in the Football world can take a lesson or two from a tiny Spaniard. Alas Clentador had to pull out and join The Manx Missile and Froome-dog on the couch watching the SBS coverage of La Grande Boucle. This stage had action all around independent of Alberto’s troubles. The Panzerwagen (Tony Martin – Omega-Pharma-Quickstep), backed up his huge efforts from the day before to play domestique for his team’s Polish young gun, The Flowerman (Michal Kwiatkowski) – who went on the attack! The Flowerman tried to stick it to the Shark, but it was not to be his day. His breakaway group also contained The Terminator (Peter Sagan) who all but wrapped up the Maillot Vert sprint competition by scoring maximum points on the first intermediate sprint. This all but guarantees him taking a position on the podium on the Champs-Élysées. Then the action kicked off in the Polka Dot competition with Purito (Joaquim Rodríguez – Katusha) punching it out with the Gurning Champ (Thomas Voeckler – Europcar) on a number of the climbs. Purito came third last year but is out of contention this year after a poor start, so he is ferociously chasing another jersey. I have never seen uphill sprinting of this nature before – awesome! But ultimately the day belonged to the Shark (Vincenzo Nibali – Astana) who grabbed the stage by the horns and hammered past everyone. In a post race interview, Purito claimed that it was like he was overtaken by an aeroplane, such was the force of the overtaking manoeuvre. A warning to the Shark – your chasers are not far behind, this race is far from over. Porte, Van Garderen, Pinot, Bardet, Valverde were all less than 30 seconds behind him. The Pit Bull (Talansky – Garmin Sharp) crashed several times on the stage and is now out of overall contention. This year’s race has become a real battle of attrition. 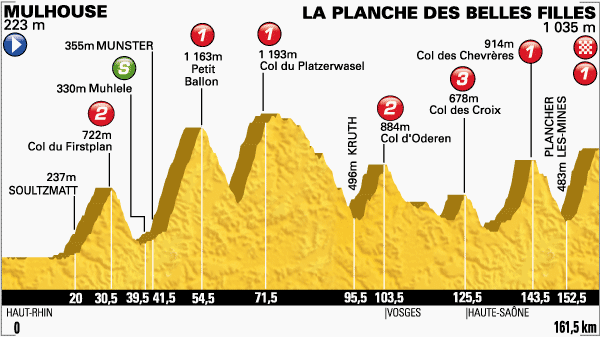 With the big Alpes and Pyrenees climbs looming there is more action to come – and I am loving it! Watching the toughest sportsmen in the world, I have decided to start a “cement” ranking that reflects truly great feats of endurance and the overcoming of pain (basically a bit of HTFU and a demonstration of adherence to Rule #5). Former winners include Jens Voigt (multiple times) and Johnny Hoogerland. Maybe ASO could make a special jersey, grey, for this category. The whole peloton should be given a cement milkshake after this stage going into the rest day, but we have to be judicious. 5pts – The Shark, who grabbed the bit between the teeth and hammered. 4pts – Panzerwagen, backing up for the second day in a row with a phenomenal display of power and sacrifice. 3pts – Voeckler and Purito, for battling it out in appalling conditions chasing the polka dots. 1pt – Flowerman, going on the attack even though it was futile. For a more serious look at the first stage of racing check out. N.B. the photos of the racing have been sourced from Cyclingnews.com and the copyright obviously remains with the copyright holder. 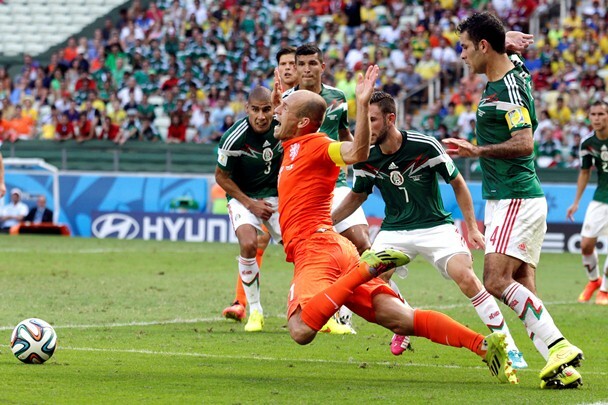 LOL – about Arjen Robben. Though in all seriousness, I think it would have been a better match if it was Germany vs. The Netherlands.